Stress can cause a great many unexpected symptoms and one of the most surprising is heartburn. If you’ve been suffering from indigestion or heartburn that is making it hard for you to sleep, then it may well be that stress is causing the problem. Here we will look in more detail at the link between stress and heartburn and at what you can do to reduce these symptoms. Why stress and heartburn are linked. To understand the link between stress and heartburn it helps to first understand how stress works in general. What Is Stress and Why Does it Cause Heartburn? Stress ultimately is a result of the fight or flight response. This kicks in whenever we are in a situation that we perceive as dangerous. When that happens, our body responds by increasing its production of hormones and neurotransmitters that increase focus, awareness, muscle contractions and more. The idea here is that stress hormones will help to increase our chances of survival if it comes down to a physical confrontation. In order to do this, our body has redirect blood and oxygen away from our internal organs. At the same time, this then means that those internal organs are losing the fuel that they might need in order to function optimally. This isn’t normally a problem in the wild, as the only time we would have been stressed in our natural habitat would have been when we were under immediate threat from a predator, forest fire or the like. It is only relatively recently that we have had to start dealing with chronic stress as a species which causes us to experience the same symptoms for a prolonged period. This is just one way in which stress and heartburn can be linked: because being stressed redirects blood away from our digestive system and thereby causes it to function sub-optimally. There are also other, additional reasons that such a link might exist between stress and heartburn. For instance, when you are stressed it’s possible that you might become more sensitive to smaller amounts of acid inside the esophagus. As we mentioned earlier, stress increases sensitivity which can be useful for detecting potential threats etc. Stress is also responsible for a number of ‘central sensitivity disorders’ which are conditions characterized by pain and discomfort. In one study, researchers found that highly stressed patients could sometimes experience experienced more discomfort even when they didn’t actually have any increase in acid production (1). There are other potential links between stress and heartburn. When we are stressed for instance we tend to eat more unhealthy ‘comfort food’ and may also eat more quickly. We tend to swallow more air as we breathe more rapidly and more deeply. Stress can also cause contractions which are thought to explain some of the link between IBS and stress. 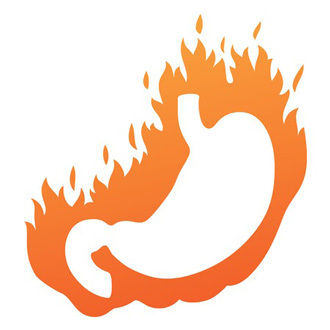 If you’re suffering from stress and heartburn then, what should you do? The most obvious solution is to try and reduce the amount of stress you’re experience and to improve your reaction to stressful events and circumstances. If you are stressed to the point where you’re experiencing heartburn and acid reflex, this is likely a strong indication that you need to try and change some aspects of your lifestyle. So how do you reduce stress in your life? One way is to identify the big stressors that are causing you the most anxiety. These can include stress in the workplace or in your relationship. If this is ongoing, then you should address these aspects of your life and even consider a new job or a change in your relationship. It’s also important to make sure you are taking regular breaks and have plenty of things to look forward to on a regular basis. Book holidays, take time off work and learn to relax when you’re at home. If you are taking on too many commitments, then try to learn to say ‘no’ more often to requests and invitations. More importantly, look at the way you are dealing with stress, the focus you are putting on it and the importance you are giving it. CBT stands for cognitive behavioral therapy and teaches a number of powerful tools that can be used to change the way you react to stress and deal with it. At the same time, try to be more careful when you are eating. Eat more slowly, try to avoid gulping air and pay attention to which foods set your symptoms off. Keeping heartburn medication to hand such as Gaviscon can also be useful. Follow all these tips and you should get a better handle on your stress and heartburn symptoms.